Notes: Lots of different acids can be used in the last step. It’s not important which specific acid is used, just that something is present that can form the alcohol. 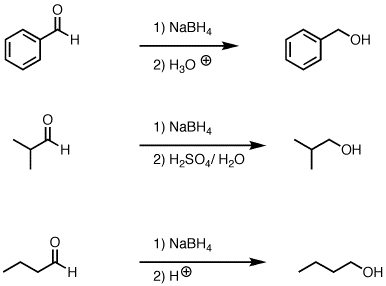 NaBH4 is a source of hydride (H-) and the reaction begins with the addition of hydride to the carbonyl to the aldehyde (Step 1, arrows A and B). Upon addition of acid, the oxygen is protonated (Step 2, arrows C and D) to give the neutral primary alcohol. Notes: The choice of H2O / H2SO4 as acid isn’t crucial – this is just an example. Any source of proton (including water) will do. Thank you, very helpful and complete, answered every question! There is a problem in my book I am having a small issue with. It states “Draw the products formed when CH3COCH2CH2CH=CH2 is treated with NaBH4 (excess) in CH3OH”. I understand that NaBH4 selectively reduces C=O while leaving C=C inert, but what protonates the oxygen in the final step to give the alcohol? Does NaBH4 do that because it is in excess, or does methanol? I don’t 100% understand methanol’s role in the reaction, just that it is typically used with NaBH4. True, but actually methoxyborohydrides are not as nucleophilic as sodium borohydride itself. It seems like the BH4 in step 1 is nucleophilic, and the H-B bond is moving (Electrons and H) to the C=O, which is why the C-O bond ‘jumps’ up. Is this not a substitution reaction? Or perhaps my definition of an Addition reaction is a bit narrow? Could you explain why in some reaction condition there were also iodine added? I’m wonder whether its goes through IBH2 reactant or this author(http://totallymechanistic.wordpress.com/2006/12/11/sodium-borohydrideiodine-reduction/) states that the reductant is the borane (BH3) which is generated in situ. Yet some people think it’s the BH3-THF complex being reductant, and then I’m not sure what’s the Iodine for. Iodine is used to form BH3 in situ from NaBH4 . It’s used, for instance, in the reduction of carboxylic acids to alcohols. Hey, what happens when there is an excess of NaBH4? Nothing bad should happen. Once the aldehyde is reduced to the alcohol, there’s nothing else that can happen (assuming you just have one aldehyde). Got a question regarding reduction of P-nitrobenzealdehyde to p-nitrobenzyl alcohol. We mixed sodium hydroxide and potassium borohydride and can’t figure out how the mechanism takes place. Does sodium hydroxide have anything to do with it, or is it only the aldehyd + potassium? I’m not sure why you added NaOH with KBH4. By the way why did you use KBH4 – you usually have to make it, and NaBH4 is much cheaper? The mechanism for reduction with a borohydride is simply that the B-H bond breaks, donating two electrons to form a new bond with the carbonyl carbon, and the C-O pi bond breaks. You end up with an alkoxide, which is then protonated to give the alcohol. No, it is not a strong enough reductant. Color changes are not a very diagnostic criteria for reactions. It’s very common to see a pale yellow colour, but that’s not unusual for a large number of other reactions. Color is not important for this process. Why is it important to you? if you have color impurity(if you are very sure) then you can treat your compound with charcoal. And this mostly works with liquid compounds. You can add a pinch of charcoal in your compound and let it stirring for some 10 minutes. Can NaBH4 and LiAlH4 cleave C=C ???????? Is KBH4 a worse reducing agent as NaBH4 for this reaction or are the about the same? Hi – I would expect that KBH4 is slightly worse, as K+ is not as good a Lewis acid as Na+. LiBH4 , for example, is a stronger reducing agent than NaBH4. LiBH4 can reduce esters whereas NaBH4 cannot. What happens if a group like C=NH is reduced using NaBH4. Does NaBH4 reduces every polar π bonded group? Imines can be reduced with NaBH4 but usually as the iminium ion (i.e. the conjugate acid of imines). This is the key process in “reductive amination”. NaBH4 certainly does NOT reduce very polar pi bonded group – it does not always reduce C=O bonds, for example. Esters and amides are generally not reduced by NaBH4 for example. What is the reaction of formaldehyde with NaBH4/H20?Reaction? Hi Sherri . A new C-H bond would form, and the C-O pi bond would break. After adding water (or mild acid) a new O-H bond would form. That would provide methanol, CH3OH.